I wonder if anyone can help me with a little problem that I have? Every time I upload a picture to my blog the quality is significantly reduced.. the background to this illustration is white but for some reason it has come up grey? I would be very grateful for any help with this.. I know exactly what is wrong. It isn't you, it is Google interference. Google has made a setting in Google+ to 'auto enhance images' that are uploaded, which actually resets the file size and changes quality and colour. Somehow this is causing all images uploaded on Blogger to be degraded and darkened. Blogger images go into a Picasa web album linked to your Blogger blog, if you were to delete them from Picasa, they would vanish from your blog - not everyone realises there is such a place, but there is. Blogger forums and Google know of the problem but they aren't fixing it fast as they want everyone to move over to Google+ where all images will then become searchable by their bots, sharable and distributed through your Google+ account, which isn't to everyones taste! Certainly not to my taste. The only way around this that I have found through the forums, is to go to Google+ and accept to transfer your images from Picasa to Google+. There is a message that states your images will then be sharable, or such like, and you have to agree. Sign up, find the bit in your new Google+ account settings about images and de-select the image resizing and image enhancing options. Then find the bit that closes your Google+ account, and close your membership. Everything then reverts back to the way it was correctly working through Picasa web albums, and the images upload in full quality again. But, any images already tainted by this Google+ error will need to be uploaded from your computer again by editing the blog posts, because they are already corrupted in your Picasa Web Album for that blog. If you want, go to Picasa Web Albums when you are signed into blogger, and it should recognise you, and you can view all the images, and see the tainted ones. Don't delete anything you want to keep visible on your blog, as this is where all your blog images are stored online and auto linked to your blog posts. If not, email me through the link on my blog, and I will try to help more. This link might help too. It was on one of the forums I learnt that you could join Google+, change the setting, and then close the Google+ account to revert back but without the problem continuing. Google ask why you decide to close your account... I told them I only joined in order to fix the enhancement error that was damaging my images! Beautiful, really playful and cute! What a beautiful illustration. 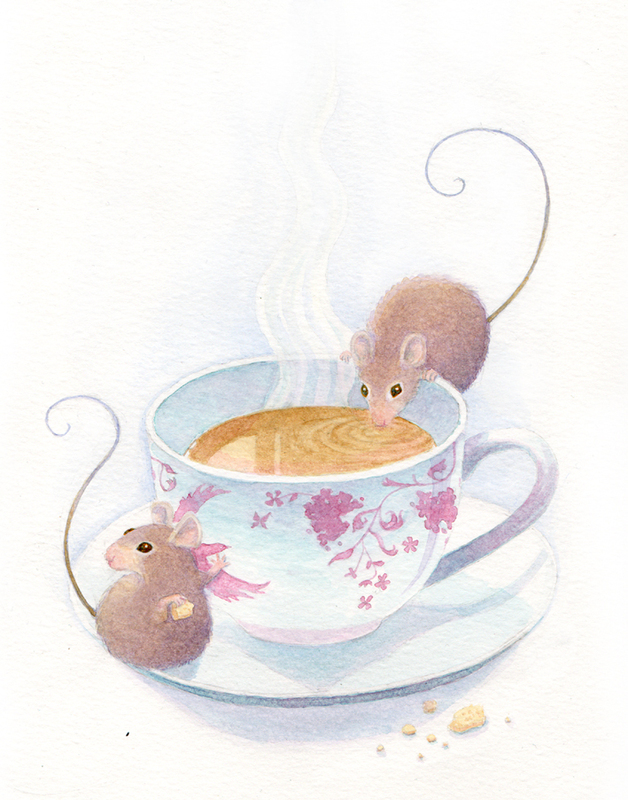 Such cute little mice. I was having the same problem when uploading my images to blogger, but I found an easy way to fix it. Go to google plus website and sign into your account. Go to Home>Settings and scroll down to Auto-enhance and turn it off. Adorable illustration. I love the detail. Thank you June and Gigi, I will take a look.. It actually looks lovely to me, and I would not have noticed, had you not mentioned it. It sounds like a frustrating issue and complicated and inconvenient to resolve doesn't it. Brand new to your blog, just discovered you! Glad to see I am not the only one with this problem. Been debating moving my site to Wordpress. I think I just might now.